In early July of 1892 an event took place in the industrial town of Homestead, Pennsylvania that would define labor and management relations across the United States for decades to come. A violent and bloody battle between Andrew Carnegie’s Homestead Steel Works and the Amalgamated Association of Iron and Steel Workers (an early incarnation of the United Steel Workers), the Homestead Strike of 1892 was a demarcation, a line in the sand, and a tragedy for the American labor movement. 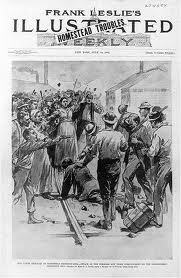 Orchestrated by Henry Clay Frick, whom a vacationing nominally pro-labor Carnegie placed in charge of operations, Frick was resolved, at any cost, to break the union at Homestead and in doing so, inflict as much damage to the then burgeoning union movement as possible. After much violence, four deaths and countless wounded, with the assistance of the infamous Pinkertons and 4000 soldiers of the Pennsylvania state militia, Frick succeeded beyond his wildest dreams. The union was smashed, severely damaging all progressive and humane aspects of the national worker’s campaign and effectively paralyzing the American union movement. The movement would remain paralyzed until the advent of FDR’s New Deal 44 long years later when in 1936 Roosevelt, in turn, would have the Michigan state militia aim their guns, not at the striking auto workers of the Ford Motor Company in Flint but at the company thugs and Flint police who threatened them. The Flint Sit -Down Strike was ultimately triumphant and thus began the United Auto Workers (UAW) in earnest and with the UAW the slow and steady rise of the American middle class. 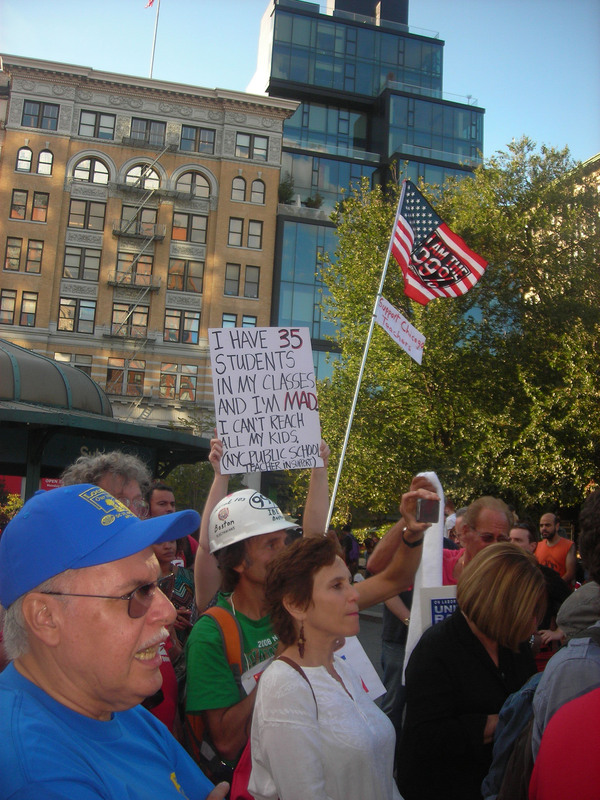 In the next four decades workers, unionized or not, would reap the benefits of and side effects of organized labor. The Homestead Strike proved a seminal and transformative moment in American history and a tragic one in the legacy of American labor. 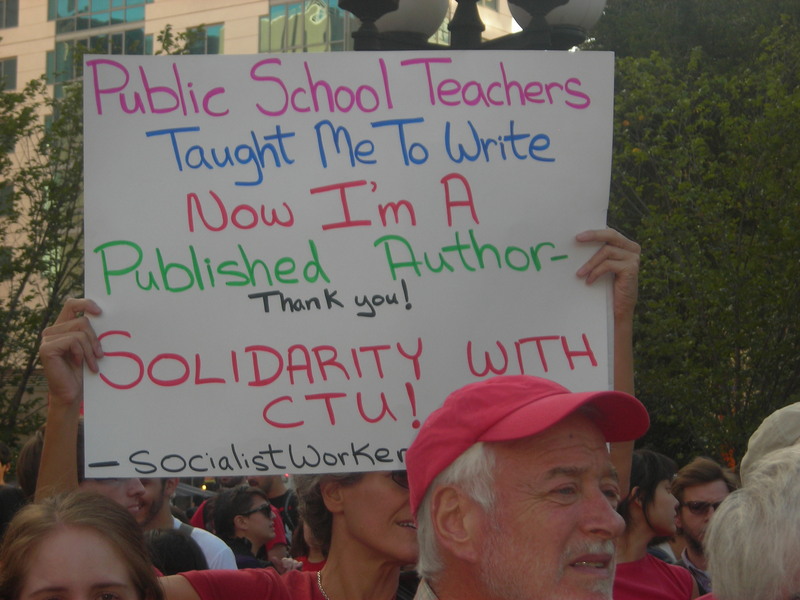 The Chicago Teachers strike, six days in the making as I write, may very well prove to reverberate as far and as wide in one direction or the other. 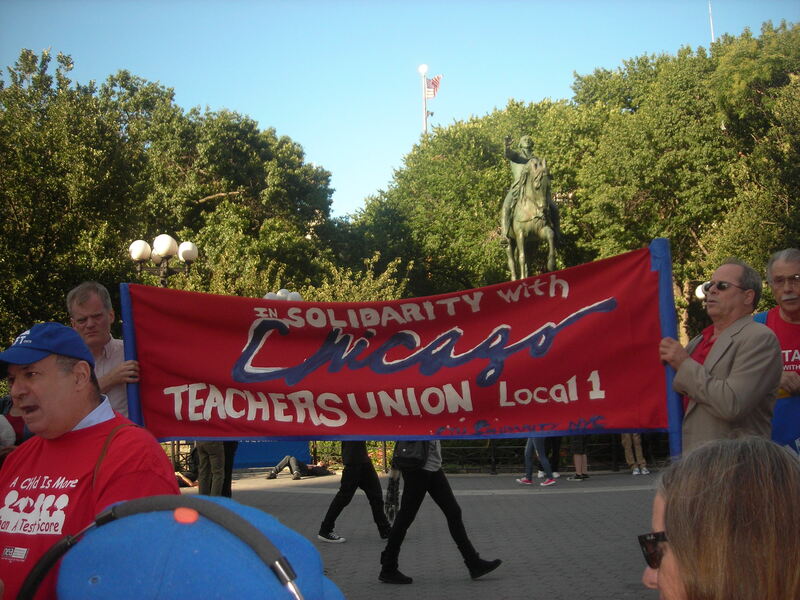 It too may ultimately determine the fate not merely of the Chicago Teachers Union (CTU), not merely the future of the American public school system, but, like the Homestead Strike, it may determine the impotence or power of American unionism in the 21st century. It too could alter the very parameters of worker rights and labor relations for all workers, unionized or not for years to come. “crisis in education” of a profoundly different and deeper nature than the “education reformers” would ever go near or , perhaps, are even conscious of. ) Much to the delight of conservatives, libertarians and above all corporatists, unions have largely been wiped out altogether or driven to their knees from sea to shining sea. This is the slow motion horror movie that has been playing before our largely unseeing eyes fro three decades. This has led directly to the well-documented decline in American income, the vanishing of the American middle class, and the most grotesque and dangerous disparity in wealth and poverty in the industrial world. Some of this may be partly true. It’s possible, I suppose, that men like Emanuel and Obama and some of the other reformers actually believe in the merit of the garbage, bubble-test-based education they are successfully force feeding other people’s children, even as it bears no resemblance whatsoever to the education they demand for their own children whose schools hold such practices in abject distain. Believe in it, that is, as long as they don’t think about it for too long or look at what it reduces people to. ( The children of Emanuel and Obama attend, respectively, the Chicago Lab School and Sidwell Friends receiving the kind of quality education all American children should receive and could receive if the right people were making policy and allocating funds. ) l and That said, long after “education reformers” have achieved enormous success in privately remaking public education in their image and implementing their various notions, schemes and experiments on American children, long after their far greater success in manipulating the American public into believing that teachers and teacher unions are the principle cause of their increasing immiseration and a mortal threat to the their children’s future, not a one of their multi million dollar schemes have proven to in any meaningful way improve education. Not one. This, even as schools across the land have been transformed into test taking stress factories, communities have been ripped apart in charter school wars, and many of the “reformers” corporate allies such as Pearson or the “reformers themselves such as Rupert Murdoch ( yes, that Rubert Murdoch ) have milked the public teat to grow rich or ever richer still than their wildest dreams. It is therefore exceedingly difficult if not out right impossible for a rational and knowledgeable person to believe that what is really driving most of these “reformers” – many of whom are billionaires or hedge fund managers, almost none of whom are educators unless you count the three year scandal ridden teaching career of Michelle Rhee – is improvement of education rather than, say, transfer of money from the public sector to the private sector or, in a word, privatization. If improving education were truly the goal of the “reformers” there would be certain fundamental steps one would expect such high-minded people to take. They might begin by respecting people who actually know what they’re talking about. They might begin by asking the question of what it means to be educated rather than, say, conditioned or trained. They might begin by engaging and empowering the most knowledgeable professionals in the field and assisting them with the extraordinarily difficult task of educating the most diverse and poverty-ridden population in the Western world. Such people are rare but they are not difficult to find. Consider Linda Darling Hammond. Or Jonathan Kozol. Or Diane Ravitch. Or, for that matter, CTU president Karen Lewis. But nothing like this was done and under the regime of the “reformers” will never be done. Quite the contrary, as befitting a corporate revolution by stealth, such people have been utterly purged from the corridors of power and influence as thoroughly, if infinitely more gently than Pol Pot purged Cambodian intellectuals in Year One of his new Cambodia. And, of course, if the improvement of education were, in fact, your goal there would be things you would not dream of doing. You would not, for instance, appoint completely unqualified persons such as Arne Duncan to run the federal Department of Education. You would not continue to champion mayoral control years after it has proven itself a disaster in city after city, allowing, in effect, people like Mike Bloomberg and Rahm Emmanuel to dictate education policy in the largest education systems in the USA. You do shower parents with contempt and shut them out of any meaningful discussion at the same time, in one of many acts of stupendous condescension, you pretend to give parents voice by acting as their ventriloquists by producing slick, shamelessly dishonest “reformer” financed propaganda films like “Waiting For Superman” or equally slick, shameless and dishonest melodramas like reformer” financed “Won’t Back Down” , both of which solve the “crisis in education” by – you guessed it, privately run publicly funded non -union charter schools. You do not impose business plans and call them education plans. You do not confuse technology with science and reduce human beings and human intelligence to data and then sell such data to your pals like Rupert Murdoch. You do not make astoundingly self righteous and ignorant statements claiming that poverty does not affect student learning or that class size does not matter and repeat such astoundingly self-righteous statements ad nausea. You do not disgrace our alleged democratic process by allowing private citizen billionaires like Bill Gates, Eli Broad, the Walton family ( of Wal-Mart fame ) and other very, very rich people to make public policy — every single one of those policies that much the more in a field of which they know nothing. You do not reduce students to bubble test-taking automatons incapable of critical thinking. You do not hound, harass, demoralize , micro manage and infantilize teachers. You do not force feed evaluation schemes based on standardized tests at all, never mind standardized tests that have margins of errors of upwards of 50% that even their creators insist should not be used to evaluate teachers. You do not casually destroy the careers of untold numbers of excellent teachers and shrink the contours of the minds of millions of children — always other people’s children — with such hare-brained if immensely profitable schemes. One can go on and on but you get the point. You would do none of these things and yet, this and so much more is precisely what Ralm Emanuel has done in Chicago and “reformers” have done across the entire United States and they have done so, to the great shame of teacher unions, with astounding and terrifying success. What Rahm Emmanuel desires in Chicago is what Mike Bloomberg wants in New York and what Barack Obama wants for the whole country, which is the sole point of the unbelievably cynical policies of Race To the Top which may be the most successful union busting policy ever to be embraced by unions. Whatever they claim to the contrary, what these men want is for teacher unions to enter into a pact to commit slow motion collective suicide; to sign their own death sentences based on preposterously trumped up charges, to die while giving their destroyers ( especially those in the Democratic Party ) as much political cover as possible. 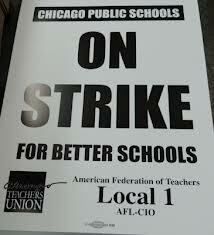 Lewis and CTU, bless their hearts, have as yet refused. With this refusal they are throwing what amounts to the first real wrench into the billionaire-backed, union busting privatization machine that has completely infiltrated and now dominates both major political parties and the entire debased discussion of what passes for education in America. The CTU are speaking truth to the power that has engineered the most sophisticated, insidious and successful propaganda campaign against a profession in American history, the lastest volleys in this campaign CNBC’s “Education Nation” and the new aforementioned anti-union weepie “Won’t Back Down.” They have sent a resounding “NO!” to the a campaign consisting of the richest individuals, most powerful corporations and highest offices of the American government who collectively want nothing less than to drive a stake through the heart of unionism in America thoroughly as did Frick and Carnegie more than a century ago. And note well, if the financial catastrophe of 2008 proved nothing else, it showed the unambiguous recklessness and rank depravity of much of the American ruling class and that it will who will stop at nothing to get its way, innocent children, teachers, in fact, the entire global population can go straight to hell for all they care. There are fortunes to be made in education. Billions, in fact. And all publicly funded and thus guaranteed. In the larger sense, it is essential to understand that this strike is about standing up against issues that go far beyond phony “education reform” campaign, as important as they are. It is essential that all Americans who are not part of the one percent understand what is at stake here. It is essential that all such Americans understand that the CTU is standing up for them as well as for the children of Chicago and themselves. 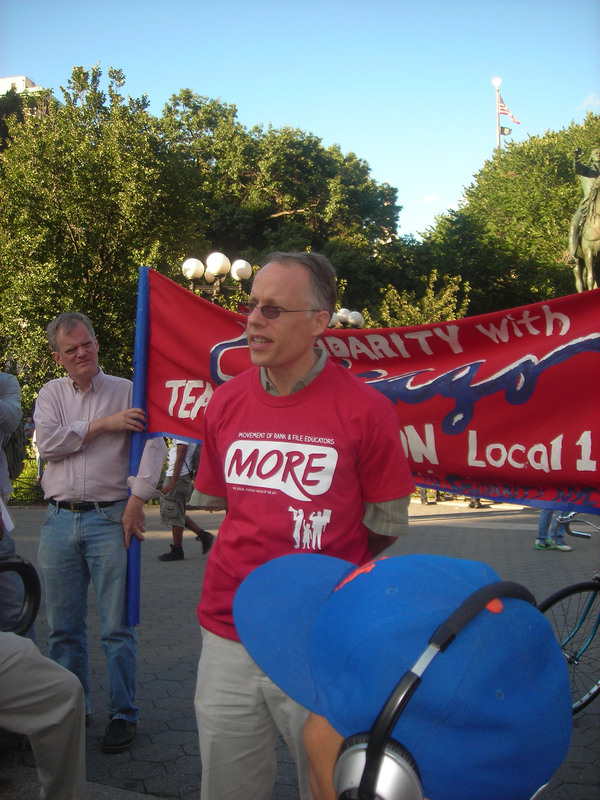 It is essential that Americans understand that the CTU is standing not merely against the evisceration of unions but standing for the very impulses and principles on which unions are created: economic justice, fair play, compassion, fraternity and solidarity, all of which are in direct opposition to the corporate mindset. 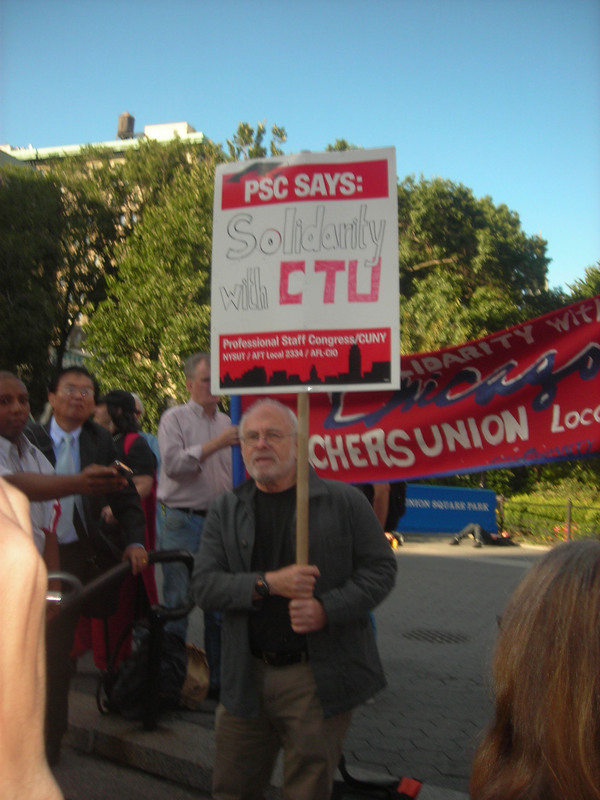 The CTU is standing up against nothing less than a corporate revolution by stealth. They are standing up against the absolute triumph of the corporate state and the absolute removal of all opposition to the corporate state. 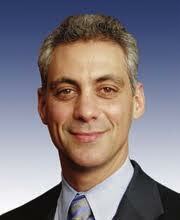 Whatever the outcome, unlike at Homestead there will be no violence or bloodshed in Chicago. The powers that be have learned far more insidious and subtle ways to try and bring down a people, strip them of their rights, force them to their knees. Consider Obama’s Race To the Top, an absolute masterpiece of coercive politics aimed at making teacher unions little more than due sucking social clubs — but that did not stop most of the nation from buying into it . But what happens in Chicago in the next few days or the next few hours will indeed reverberate across this land as did Homestead. To be sure, sooner or later more than teachers will feel its effects. To be sure, sooner or later the outcome will effect every member of the 99 % . It is conceivable that out of the courage and steadfastness of the CTU will arise, phoenix-like, a rebirth of American unionism. It is equally conceivable it could signal labor’s death knell. One thing is for certain: every worker in America should be supporting the CTU and making that support as public as possible. Rest assured the eyes of every cognizant teacher in the US are on Chicago and hopefully, too, the eyes of many an American worker. To be sure, so too are the eyes of the one percent. 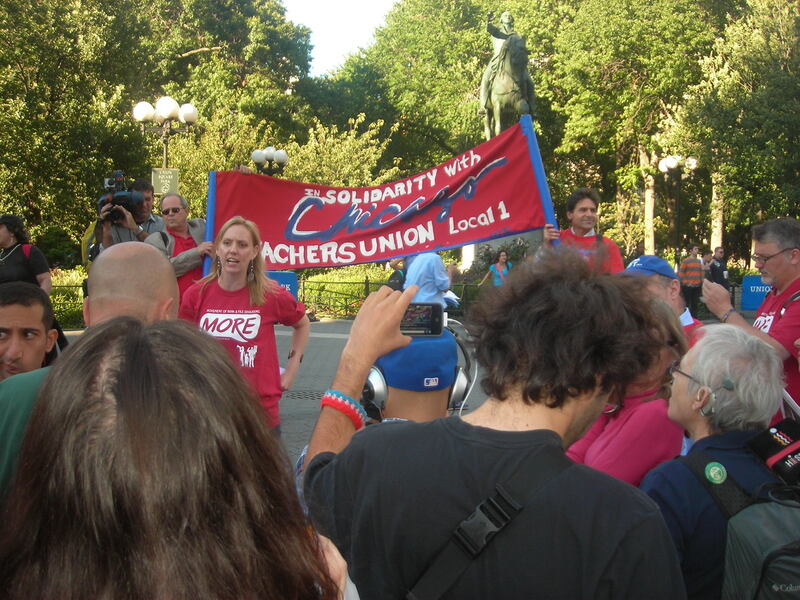 In a show of solidarity with Chicago’s striking teachers hundreds of New York City educators along with union leaders and parent activists rallied in Union Square this afternoon. 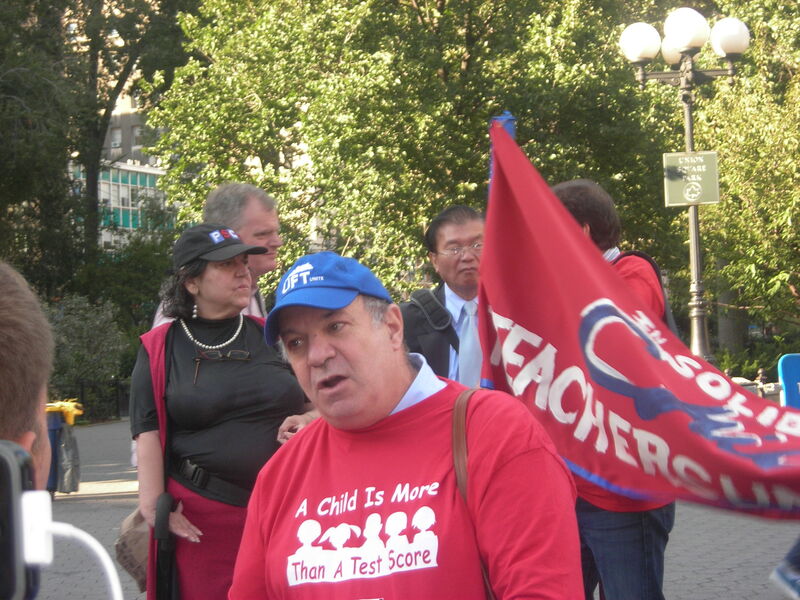 The rally was organized by the Movement of Rank and File Educators (MORE), a newly formed caucus of the United Federation of Teachers (UFT) and drew approximately 350 people. Among the speakers were UFT Secretary Michael Mendel and parent activist extraordinaire Leonie Haimson, founder of Class Size Matters. 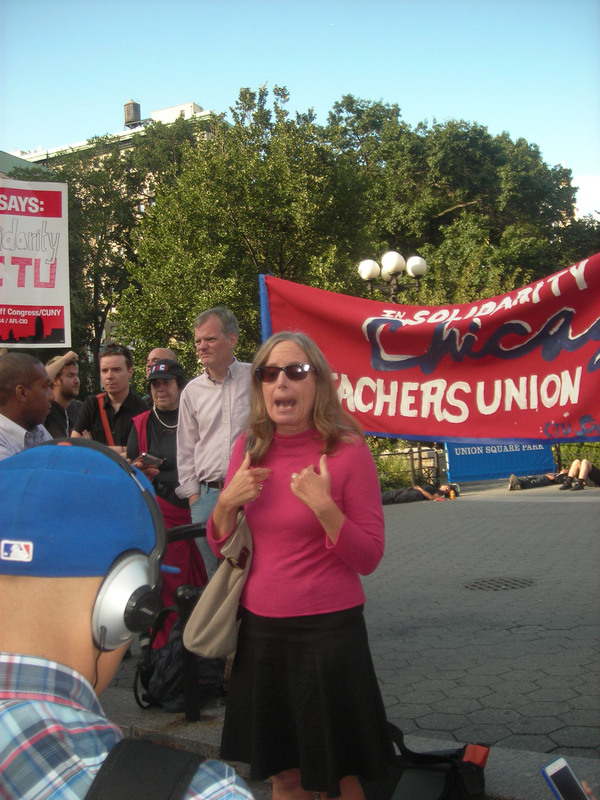 Haimson noted that contrary to what the corporate press was reporting, the major concern of the CTU was not money but insane evaluations based on standardized tests, class sizes, and humane work conditions for both students and teachers. 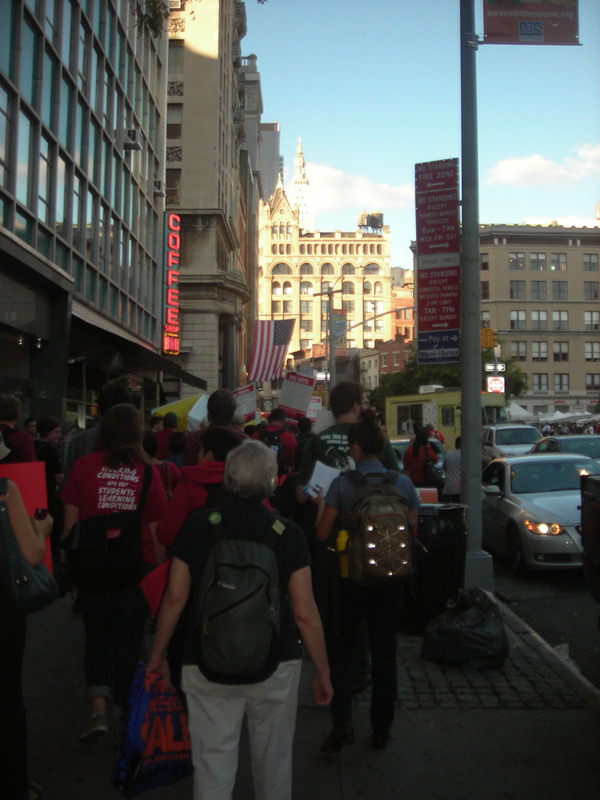 The rally concluded with a spirited march up to the 23rd St office of the reprehensible Democrats For Education Reform (DFER ), run almost exclusively by hedge fund managers who, in a sane world, would be sitting in eight by ten jail cells instead of privatizing the public school system.